Today I flew to Phnom Penh, Cambodia for the last leg of my long journey. 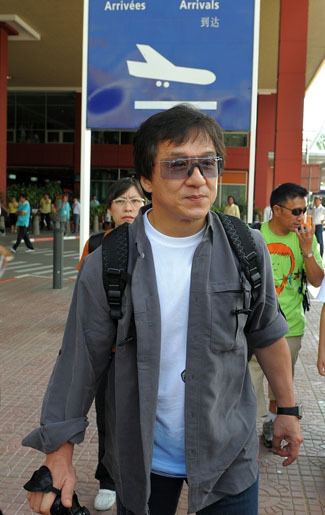 When I arrived at the airport I felt very happy to be back among the Cambodian people. This is my third trip to Cambodia and the thing that I always remember is how warm and friendly the people here are. After resting, I got ready to go to the “Hello Peace!” show at a local television station. 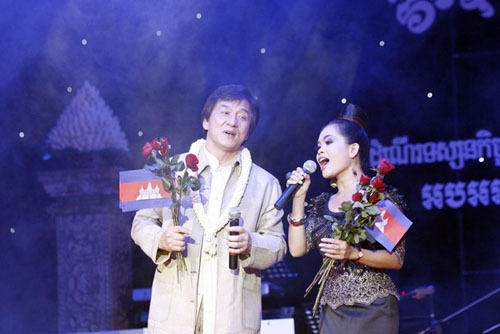 I performed with some of Cambodia’s top singers, including one very talented girl named Him Sivorn. I was told that she is one of the most popular singers in Cambodia. She even sang in Chinese with me! After an enjoyable evening, I ate some dinner and then went to sleep, happy to be back in Cambodia. This morning I met with Deputy Prime Minister Sok An. We talked about the possibility of my making a film in Cambodia some day. 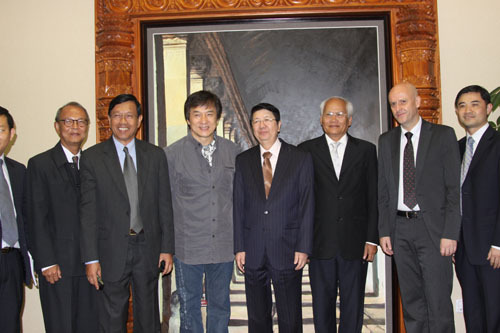 The Deputy Prime Minister told me about the beautiful countryside and all of the benefits of filming in Cambodia. I told him that after I visited Cambodia in 2004, I began writing a script when I returned home. My idea was to write a movie script that would highlight the tragedy of the landmines that are buried all over the countryside, killing and injuring so many people every year. 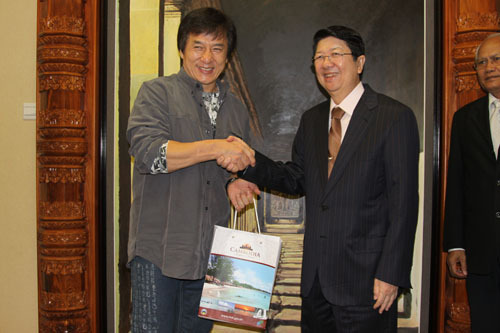 He was very supportive and I told him that I would do my best to make a film in Cambodia some day. Sometimes it can take me years to fulfill promises, but I always try my best to do so. Sometimes I get an idea for a story and it will sit in my head for many many years before an opportunity comes along to actually use it. I want to make sure that all the movies I make from now on will have a very strong message. I don’t have to make movies just for money anymore and I’ve made enough movies for fun. Now I want to do something to help people and if I can make a film that will spread out a message about peace, the environment, or an important social problem, then I will do it. And I mean it from the bottom of my heart when I say that I will try my best to make a movie in Cambodia someday. 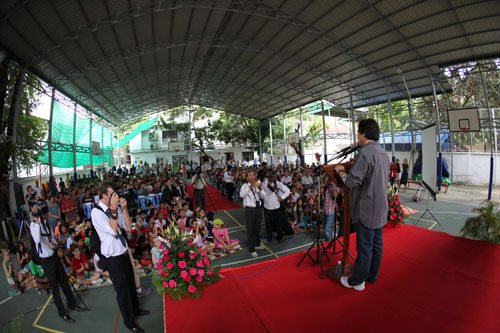 After my meeting with the Deputy Prime Minister, I went to the International School of Phnom Penh. I met with the students and talked to them about the things that I would like to see them do: study hard, take good care of the Earth, and do their best. As I stood on the stage and looked out over the crowd of children, I was so happy! Why? Because sitting in front of me were kids of all different races, with all different skin colors and they were all together like one big family. This is my wish for our world, that people of all races, religions, and nationalities live together like a big family, taking care of each other and loving each other. I think that a dream like this begins with the children and when I see a gathering like this, I feel like I’m looking at the future that I want for everyone. In the afternoon I went to the University of Cambodia to give my talk for the International Peace Foundation’s Bridges event. I told these students about many of the same things that I spoke to the students in Thailand about. I won’t bore you with repeating them ha ha! I asked these students to continue to study and work hard and then to find a way to help others in our world. I reminded them that although we may live in different countries, speak different languages, and worship different gods, we are all residents of planet Earth and we need to take care of it and take care of each other. Then I showed them how to crush their water bottles down and asked them to make small efforts for the environment in their daily lives. I believe that if you get into the habit of doing these things – conserving water, not wasting paper or food – you will eventually change your behavior. And small changes can lead to big changes. That is my hope. I was very touched to receive an Honorary Doctor of Humanity. So now you must call me “Professor Chan” or simply “Dr. Chan.” Ha ha. I’m just kidding. 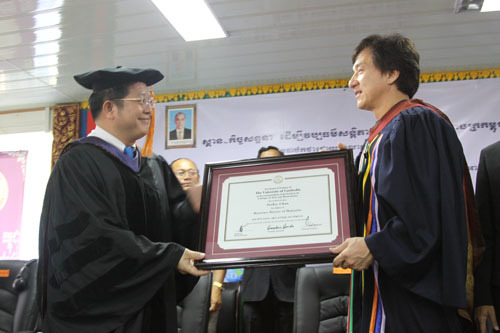 You can call me “Jackie.” But I was so proud to receive this honorary degree. Those of you who know me know that one of the single biggest regrets of my life is not getting a proper education. Although I’ve learned a lot in my lifetime, there is nothing that is equal to a real education. So all you students out there, study hard! You are very lucky to be able to study and become educated.